Protesters opposing the proposed Dakota Access Pipeline at the Oceti Sakowin Camp in North Dakota. Lawmakers in the state have proposed bills that would increase penalties for protesters who block highways. Bills in state legislatures across the country would increase penalties for protests that block highways, such as these in St. Paul, Minn., in the summer of 2016. A bill in Iowa was inspired by a protest against Donald Trump shortly after the November election. More than 100 demonstrators blocked traffic on Interstate 80, just outside Iowa City, Iowa, stopping traffic on the busy trucking route for almost a half-hour. "You're impeding law enforcement ability to get to call where there could be serious life-threatening situations," said Chapman, who also works for an ambulance service. Opponents of the bill call it an attack on free speech. "Republicans have taken over state legislatures across the country and they appear interested in punishing people with different views than theirs," said Democratic state Sen. Joe Bolckom of Iowa City. In North Dakota, where protests have gone on for months over construction of the controversial Dakota Access Pipeline, a lawmaker has introduced a bill that would allow motorists to run over and kill any protester obstructing a highway as long as the driver did not do it intentionally. Bills that would increase penalties on unauthorized protests have also been introduced in Michigan and Washington. 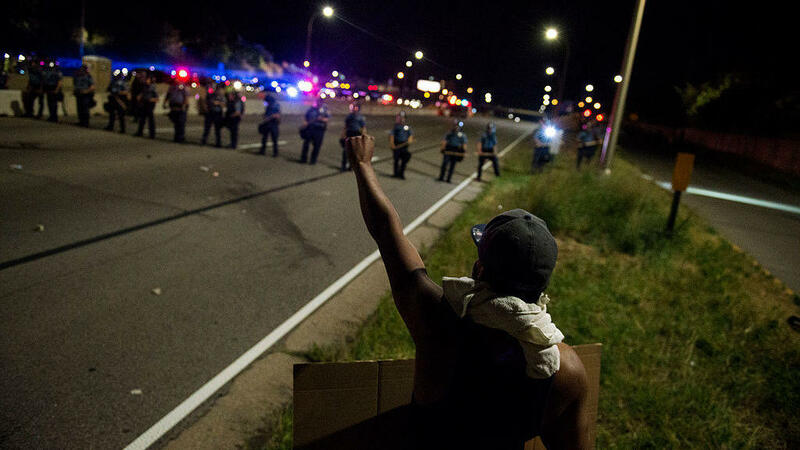 Last week in Minnesota, a House committee approved legislation that would increase penalties and charge demonstrators the cost of policing protests. After the fatal shooting by police of Philando Castile, Black Lives Matter protests blocked busy interstates in the Twin Cities. Republican state Rep. Nick Zerwas cited the cost of responding to protests for taxpayers as justification for the bill. "These individuals have broken the law," Zerwas said at the hearing. "It is against state statute to be on the freeway." The hearing became heated when John Thompson, a friend of Castile, testified, telling lawmakers the protesters were trying to focus attention on the issue of police killings. "You know what they were doing? They were asking for all you guys to come out and say what is it we can do to help you," Thompson said. "Not one of you came out!" As protests continue to ramp up nationwide, Rita Bettis, with the American Civil Liberties Union of Iowa, says elected officials should be protecting free speech rights. She says bills like the one in her state do the opposite. "In our country where the government's power flows from the people, peaceful protest is a source of democratic strength, not a weakness, and it deserves to be protected and cherished," Bettis says. "Not attacked." Advocates like Bettis say if a few states can reduce a demonstrator's ability to block traffic, it could have a chilling effect on Americans' right to protest. Tim Nelson of Minnesota Public Radio News and Amy Sisk of Inside Energy contributed reporting to this story. We've seen a lot of big protests over the past year from Black Lives Matter to the movement against the Dakota Access Pipeline. And since the inauguration, we've seen even more massive protests against President Trump's policies. Now, as Iowa Public Radio's Clay Masters reports, a number of Republican-controlled state houses are considering increased penalties for protesters who block roadways. CLAY MASTERS, BYLINE: Soon after Donald Trump was elected president, more than 100 protesters blocked traffic on Iowa's busy Interstate 80 just outside of Iowa City. It stopped traffic for almost a half hour. MASTERS: Now a Republican state senator here wants to make it a felony for anyone who intentionally blocks traffic on busy highways, punishable by up to five years in prison. Senator Jake Chapman introduced the bill. He's also the chief operating officer of an ambulance service. JAKE CHAPMAN: You're not just stopping traffic, OK? You're impeding law enforcement's ability to get to calls where there could be serious life-threatening situations. MASTERS: Opponents of the bill say there are already laws on the books. And there are. Senator Joe Bolkcom is a Democrat from Iowa City. He says the proposal is punitive, unnecessary and more about politics. JOE BOLKCOM: Republicans have taken over state legislatures across the country, and they appear interested in punishing people with different views than theirs that want to assemble and use their rights of free speech. MASTERS: As Bolkcom mentions, similar bills are cropping up in other states. 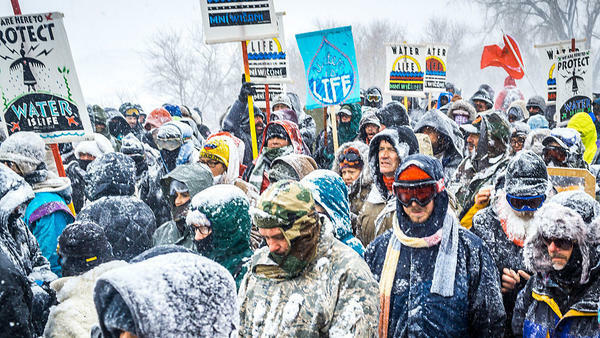 Take North Dakota, where protests have gone on for months over construction of the controversial Dakota Access Pipeline. UNIDENTIFIED CROWD #2: (Chanting) I believe that we will win. UNIDENTIFIED WOMAN: (Chanting) I believe that we will win. MASTERS: A lawmaker in that state has a bill that would allow motorists to run over and kill any protester obstructing a highway as long as the driver did not do it intentionally. There are bills in Michigan and Washington State. Last week in Minnesota, a House committee approved legislation that would increase penalties and charge demonstrators the cost of policing protests. Black Lives Matter protests blocked busy interstates last year in the Twin Cities following the fatal shooting of Philando Castile. Republican Nick Zerwas says, the cost of these protests go back to the taxpayers. NICK ZERWAS: These individuals have broken the law. It is against state statute to be on the freeway. MASTERS: The hearing became heated when John Thompson testified. He was a friend of Philando Castile's, a black man who was killed by a police officer during a traffic stop last year. Thompson told lawmakers he did not block the interstate, but he understood the protesters' message. JOHN THOMPSON: You know what they were doing? They were asking for all of you guys to come out and say what is it that we can do to help you. Not one of you came out. MASTERS: After the vote, a protest and chants of shame broke out in the hearing room, forcing the meeting to end. UNIDENTIFIED CROWD #3: (Chanting) Shame, shame, shame, shame, shame, shame, shame, shame. MASTERS: With protests likely to continue nationwide, Rita Bettis with the ACLU of Iowa says elected officials should be protecting free speech rights. She says bills like the one in her state do the opposite. RITA BETTIS: In our country where the government's power flows from the people, peaceful protest is a source of Democratic strength, not a weakness. And it deserves to be protected and cherished, not attacked. MASTERS: Advocates like Bettis say if a few states can reduce a demonstrator's ability to block traffic, it could have a chilling effect on Americans' right to protest. For NPR News, I'm Clay Masters, in Des Moines. (SOUNDBITE OF DJ MAKO SONG, "LOOK") Transcript provided by NPR, Copyright NPR.